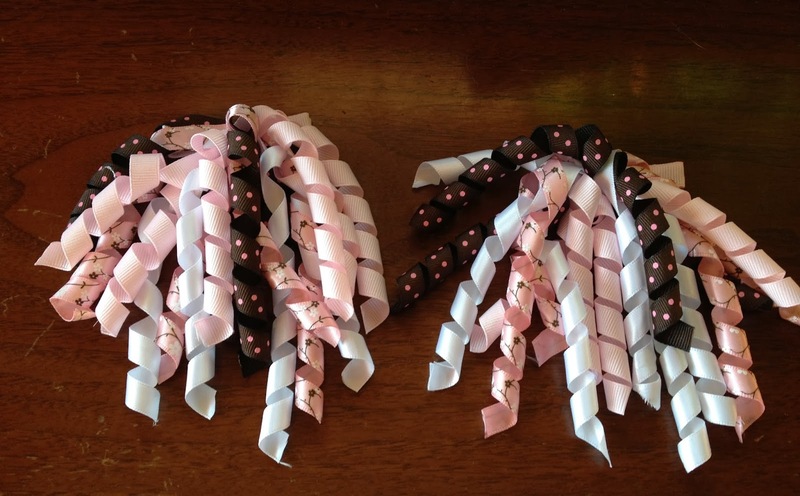 A few days ago I posted on how to make korker ribbon. I mentioned that I wanted to try to make korker ribbon hair bows to put into my Halloween Treat Bags. Well here are the results. This is the first ones I tried. I cut the ribbon at 6" which gives a longer waterfall effect. These looked so cute on my little girl. But she would NOT let me take a picture of her. These are the second set I made. For these the ribbons are cut at 4". Here are the third and fourth set I made. All of these are cut at 2.5". I am not going to post a tutorial because there are so many good ones out there. And I feel really tutorialed out (is that a word?) right now. Here is the one I learned from. I found that using a needle and thread to sew the ribbons together worked best for me (it is the third method in the linked tutorial). Then I hot glued the ribbon bow to the barrette. Pretty simple. I liked the needle and thread because it kept the ribbons in place. These ribbons can get pretty unruly. One thing I have learned is that you need to use a whole lot more ribbon segments than you think you need. I used 18 or so in the above pictured bows but really should have used 30 or more each! That is a LOT of ribbon. These are VERY cute! I buy them every once in a while, but I never knew they were that easy to make! So cute! The cheerleaders for our local football team wear these. I never realized I could make them. Those turned out so well! Thanks for posting both links on This Momma's Meandering Mondays so we could see the process and the result! These hair bow are VERY cute! I buy them every once in a while, but I never knew they were that easy to make!